The meat is cut into parts, such as tongue,shoulder meat, ahuck meat, spencer roll, strip loin, tenderloin, chuck rib, rump, short plate, round meat, shank meat,and tale. 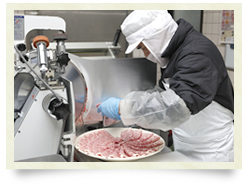 To ensure maximum taste of each meat, these are processed according to the technique based on the background of 100 years work. Our products are send safely using the total controlled distribution system to the customers.